No, not really! It's going to be a great birthweek here in San Fran and later in Tahoe. Age be damned! I'm 39, going gray, and falling to pieces, but I'm here! (That was totally my Whoopi in The Color Purple moment). Now, about this photo. There are three amazing things to point out. 1. 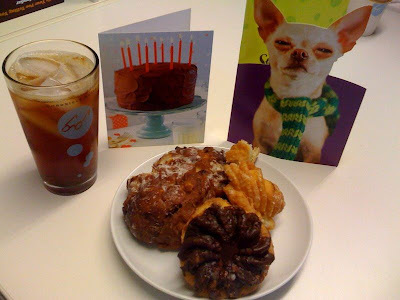 The chihuahua card is from my longtime friend Petra with whom I've reconnected thanks to Facebook. Go web 2.0! 2. The plate of evil (AKA pastries) is from Renee--who claims that calories don't count on certain special days. I will not be a guinea pig for this hypothesis. 3. I really do have iced tea ALL THE TIME!! Rand and I are going to dinner somewhere secret tonight, then I'm taking a long weekend trip to Tahoe with seven great friends. The weather should be wonderful--sunny and in the 50s--and I'm looking forward to laughs, Euchre, Boggle, good food and wine, and time with friends. It's good to be in my late-mid 29s. Happy birthday to me, happy birthday to me. . . . Happy Birthday Todd. I'm 41 and hope to someday look as good as you do!